How You Can Help | Amesbury Educational Foundation, Inc.
Raising funds of sufficient size to make a difference in our schools is a challenging task. We invite you to help us provide and promote continued excellence in education for Amesbury Public School children. 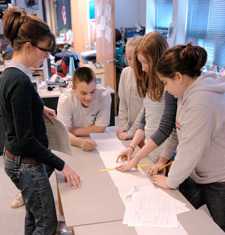 Amesbury Middle School students track seismic activity in Gale Regis’ science class. Regis received an AEFI grant to fund this project. Funds raised by the Foundation are primarily distributed in the form of grants to teachers and administrators. However, programs may be established by the Foundation for designated, endowed funds. We give 100% back to the educational community for programs supported by the Foundation. In order to accomplish this we need a large base of continued support. You can invest in Amesbury’s public education with tax deductible* donations of cash, life insurance policies, stocks and securities, property, memorial gifts or planned giving. Talk with your financial advisor about the best way for you to contribute. Visit our Donations Center page to read about the many programs you can support with your contribution. As always, we are also grateful for in-kind contributions, volunteers, and new members. Use our contact form to let us know how you would be able to help. And don’t forget that your participation — attending our annual Autumn Evening of Giving and Hall of Honor banquet, or participating in the A+ Awards and Peter Gray Friend of Education recognition — also helps us build our financial resources. Every little bit helps! Please contact us to let us know how you’d like to participate. *Note: Some gifts and bequests may qualify for both federal income tax and estate tax reductions. Gifts of appreciated property may avoid capital gains taxes.